The curtain between the mortal seas and the spectral abyss has once again been torn wide open. Barnabas' spectral powers have cursed all pirates into a ghostly state! Only a horde of wicked Brigands and Barbarians who have made a pact with the pale Brigand King have been spared, and even now they race to do his unearthly bidding! Arise ye spectral swashbucklers, and defeat these turncoats to the mortal realm and shatter Barnabas' hold over the corporeal seas to restore the divide between the planes! The pirates of the oceans have been divided into several spectral teams, each charged with dispelling Barnabas' fiendish curse. For the duration of the competition, each individual Brigand or Barbarian you defeat will give your team credit for weakening Barnabas' curse. Thus, the larger the ship you take on your hunt, the more good you'll do! Not only that, but if you happen to lose the melee, you'll still receive credit for any Brigands/Barbarians you were able to defeat! The Wraithly Raiders competition will stretch through Halloween until Friday, November 2nd, so get to your boats and save the seas: there's trophies in it for you! Full details can be found here. Wraiths aren’t the only thing stalking the shadows on the oceans. Ye’ll know ye’ve found one of these Sinister Boxes by the strange scratchin’ sound emanatin’ from within. Look closely inside the darkened crate and ye may discover Shadow Spiders, Shadow Monkeys, Shadow Foxes, Shadow Tigers, 'n more waiting to leap out at ye. From now until 3:00 PM PDT on November 2, 2018 you'll receive a free Sinister Mystery Box for every $9.99 you spend on doubloons, or every month of subscription time you purchase! For more information about the full contents of the Sinister Mystery Box, as well as the official rules, please click here. 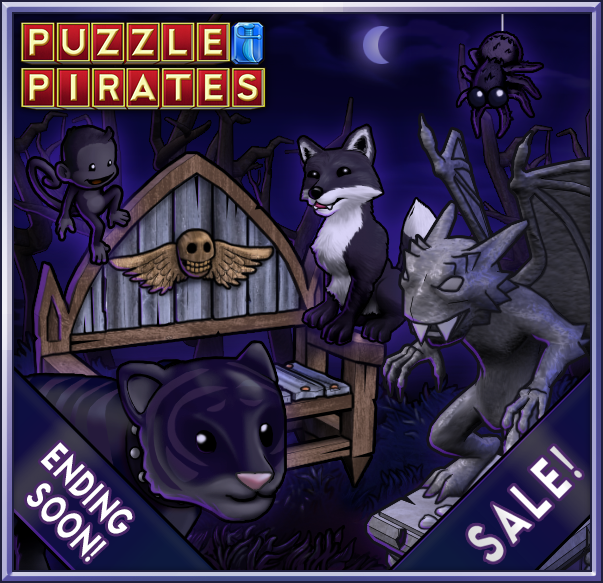 Sinister Boxes are only available for a limited time, so act before they disappear into the night! Comments are moderated for the benefit of all readers and published at the discretion of weblog owners. Our comment policy is here.